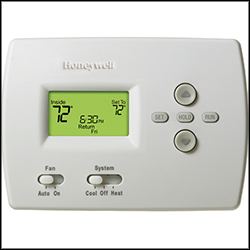 Honeywell is the leading manufacturer of thermostats, and we choose Honeywell for a full line of quality thermostats to meet the needs of every customer. Their thermostats are easy to install and conveniently work with your lifestyle. From standard thermostats to 7-Day Programmable thermostats to Wi-Fi and Smart thermostats — Honeywell has them all. Honeywell products are affordable, durable and high-quality. With dozens of different models and features to choose from, finding the perfect thermostat for your home is easy. Whether you are moving into a new home and need a thermostat, or just want an upgrade from your old thermostat, Honeywell has a model for you. For more information about Honeywell products from Pro-Tech Heating & Cooling, please contact us here or call us directly at 616.453.5000.